If you’ve ever found yourself in a situation where you had a cheese but didn’t know what type of wine or spirit to pair it with, then you’re a douchebag cuz you should be able to eat anything with any drink. But for all you douchebags out there, cheesecupid.com is a site that shows you what drinks (wines, beers and spirits) go well with what cheeses and vice-versa. It even provides audio entertainment by pronouncing the names of each cheese and a short useless commentary about the cheese. Its actually pretty useful for those who feel that there are rules for eating food. But honestly, I think I can do without the rules. And you’re still a douchebag. In-N-Out is coming to NYC!!!! Sorry, kids. This seems like a sick April Fool’s joke. I mean, who would joke about something like this? A sick sick man, I say. Last Supper plates get bigger. We’re fat. 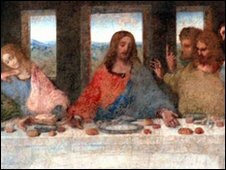 It seems that the portions of food in recreations of the Last Supper have increased by as much as 66% over the centuries. Scientists analyzed the ratio between the sizes of the bread and other plates of food compared the the sizes of the disciples’ heads. 1- Not only are people fat, we THINK fat. 2- Scientists have too much time on their hands.